Polymer solar cells are a promising new type photovoltaic conversion device with the advantages of lightweight, large-area, flexible and low cost roll-to-roll production by using the convenient well-developed solution-based thin film deposition technology. For the sake of highly efficient photocurrent conversion efficiencies of organic thin film solar cells in terms to reduction of carbon dioxide emissions, we intended to develop some materials for such organic thin film solar cells and designed novel device structures in FY2008. We firstly made guidelines for development of novel donors, acceptors, and electrodes for organic photovoltaic devices and tried to optimize and evaluate the fabrication process of single cell with commercially available materials. Followings are main research achievements in the year of 2008. In order to develop novel materials with highly efficient light-harvesting properties and/or electron transporting properties, we started to synthesize novel compounds and investigated the self-assembling behavior and appropriate semi-micro phase-separated state. Particularly, we focused on the synthesis of porphyrin lipid as a donor and fullerene C60 lipid as an acceptor and confirmed the formation of fibrous assemblies (Fig. 4-1), induced circular dichroism, and so on. Photovoltaic properties such as the extent of photoinduced current, carrier density, lifetime, and so on under the various conditions are investigated underway. Fig. 4-1. 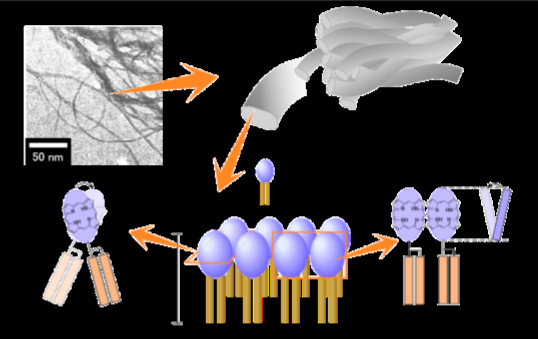 Porphyrin lipid can form a molecular gel in organic media through three-dimensional network formation with chirally self-assembled nanofibrillar aggregates. We prepared ZnO nanorod arrays (Fig. 4-2) and TiO2 nanotube arrays for transparent and highly conductive electrodes and applied them to hybrid type solar cells. Especially, hybrid organic-inorganic solar cells have been focused on producing materials in the combination of metal oxide with high electron mobility and organic semiconductors of conjugated polymers. In this sense, we demonstrated the charge injection efficiency of hybrid solar cell consisting of poly (3-hexylthiophene) and (6,6)-phenyl C61 butyric acid methyl ester/ZnO with and without N719 dye. 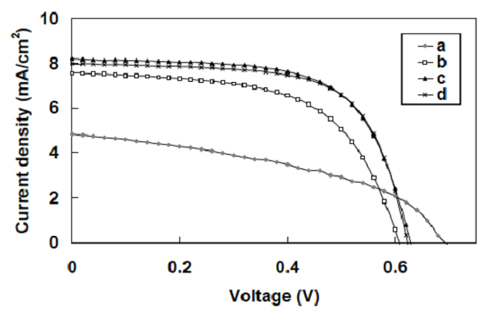 After the modification of ZnO nanorod arrays with N719, short-circuit current density of 8.89 mA/cm2 was obtained, and it was 1.5 times higher than that of without the N719. The power conversion efficiency was enhanced from 1.2% to 2.0% through the additional surface modification of the ZnO nanorod array with N719 dye. Fig. 4-2. 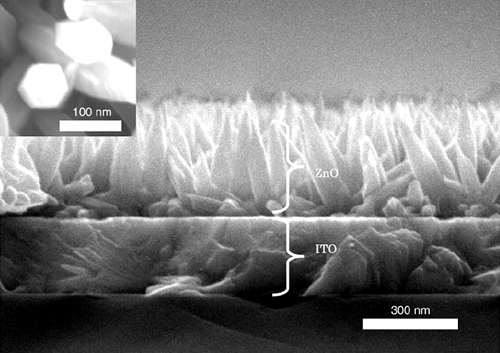 SEM cross-sectional images of ZnO nanorod arrays on the ITO substrate. The inset shows the top view of ZnO nanorod arrays. We tried to optimize and evaluate the fabrication process of single cell with commercially available compounds and feedback the results for next design after FY 2008. Single mode microwave irradiation was successfully applied to improve the efficiency of polymer solar cell based on poly (3-hexylthiophene) and (6, 6)-phenyl C61- butyric acid methyl ester for the first time. Treatment of 93℃ for 4 minutes irradiation was possible to achieve the same effect as the thermal annealing of 150℃ for 6 minutes, proving this method superior for morphology control under the mild condition. Energy conversion efficiency of 1.46% for untreated device was improved to 3.30% after microwave irradiation under the condition of A.M.1.5, 100 mW/cm2 (Fig. 4-3). Fig. 4-3. I-V characteristics of polymer solar cells (AM 1.5, 100 mW/cm2): as prepared without heat treatment (a), with annealing at 110˚C for 4 min (b), annealing at 150˚C for 6 min (c), and microwave irradiation for 4 min (d). Toward sustainable society, chemical conversion of solar energy as artificial photosynthesis is potentially promising for efficient utilization of renewable energy sources in addition to the well-established thermal and electrical utilization of solar energy. Before the development of the photo-driven oxidase, which was designed by mimicking the material conversion process in photosynthesis, we aimed at the construction of photoelectric transducers consist of light-harvesting antenna and charge transporter in this year. DNA scaffold would be suitable for hole transporter because double stranded DNA forms highly organized self-assembly and mechanism for hole transfer in DNA have been studied extensively. 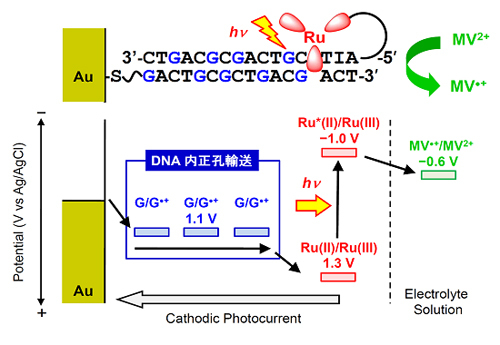 Ruthenium(II) complex was an attractive candidate for light-harvesting antenna because Ru(II) complex was utilized as oxidant to probe DNA charge transfer both spectroscopically and biochemically, and the absorption spectra of Ru(II) complex extends over visible region. Accordingly, DNA-modified films tethering Ru(II) complex as a photoelectric transducer were constructed by the hybridization of thiolated DNA immobilized on a Au surface with Ru(II) complex-labeled complementary DNA. A stable cathodic photocurrent appeared immediately under the photoirradiation of the modified gold electrode at 436 nm. In contrast, the photocurrent dropped instantly when the illumination ceased. Additionally, the cathodic photocurrent increased sharply with increasing negative bias on the gold electrode. This indicates that the photocurrent generation was controlled by a positive charge transport, i.e., hole transport between the gold electrode and the DNA. Energy diagrams of the photocurrent generation in the DNA films are shown in Fig. 4-4. The photocurrent process is mainly divided into four processes, that is, charge injection, charge recombination, charge conduction along the DNA, and charge hopping to the Au electrode. In conclusion, we succeeded in the construction of the appropriate photoelectric transducer consist of Ru(II) complex and DNA scaffold because DNA-modified films tethering Ru(II) complex exhibited cathodic photocurrent under visible light irradiation due to photoinitiated hole transport through DNA duplexes. Fig. 4-4. Schematic representation of cathodic photocurrent generation along the DNA duplex, which is immobilized on a gold electrode. A photosensitizer, Ru(II) complex, and thiol group are attached at both 5’-ends of the DNA. Lithium-ion batteries have already gained a large market share in the field of small-scale batteries and are becoming increasingly important as an essential energy storage medium, in particular for utilization of solar energy and other “new energies”, and further for any types of electric vehicles including hybrid and plug-in hybrid ones. Our group has targeted to develop electrode materials for lithium-ion batteries in terms of syntheses of new electrode materials and investigations of their basic electrochemical properties. In our recent studies, we succeeded to fabricate a composite material of ferric oxide and carbon that was applicable to cathodes for rapidly chargeable and dischargeable lithium ion batteries. In this study, we develop new electrode materials and examine them from a standpoint of the practical application in which lithium-ion batteries are incorporated in photovoltaic power generation system in the form of power storage device. To this, this year we have intended to establish the fabrication method of a practical electrode sheet in the 2032-type cell using our newly developed materials. Also we have continued to conduct a basic study on new materials in terms of synthesis, characterization, and evaluation of electrochemical property. These results are described in detail below. For the establishment of fabrication of electrode sheet for 2032-type cell: Using the (ferric oxide)/carbon composite as an active material, mixing ratio of a conducting additive and a binder material to the active material, thickness of electrode mixture and current collector foil, coating conditions (speed of applicator, viscosity of coating paste) and drying condition of coated paste were investigated and optimized. Finally we succeeded to construct the cell containing the electrode sheet of the (ferric oxide)/carbon composite, whose discharge-charge performance was as high as expected from the result measured beforehand using a test cell for electrode performance evaluation. For basic research on the electrode material: The lithium intercalation property of cobalt vanadium oxide CoV3O8 having tunnel space along the c-axis of the crystal structure was investigated. Lithiated samples, LixCoV3O8, were structurally analyzed by the Rietveld analysis. From the linear variation in the lattice parameters during lithiation, it was found that lithium was intercalated in the host compound CoV3O8 for 0.125 < x < 0.5 in LixCoV3O8. For x > 0.5, no change in the lattice parameters was observed, and an amorphous substance was formed. On the basis of the variation in the interatomic distances between oxide ions, the cavity size and molar ratio Li/CoV3O8, the site suitable for lithium intercalation was determined. For dye-sensitized solar cells and quantum dot-sensitized solar cells, thin film processing on conducting glass substrate for wide-area, low cost and low environmental impact have been required. Homogeneity and good mechanical properties of thin films are also important for such a thin film. Furthermore, low (ambient) temperature process is favored to apply the plastic conducting films. In FY2008, we have studied on the preparation and evaluation of semiconductor thin films by spray layer-by-layer (LbL) method. Titanate nanowire thin film was successfully coated on glass substrate by using spray LbL method with controlling the thickness of tens of nanometers. (J. Ceram. Soc. Jpn., 117, 381 (2009)). Fig. 4-5. Preparation and microstructure of titanate-nanowire thin films by spray-LbL method. Crystalline silicon solar cells currently hold more than 80% of the total solar cell production. Since they have high conversion efficiency, high reliability and low environmental impact, they are expected to be mass-produced and widely used all over the world in the future. However, the cost is rather high for conventional production methods of solar-grade silicon, which is the most important challenge for the silicon solar cell industry. Thus, the purpose of this project is to develop a new and low-cost production method of solar-grade silicon. We focus on the electrochemical processing in molten salts for this purpose. In PY2008, we especially concentrated on the electrolytic reduction of SiO2 in molten CaCl2. The plans of PY2008 were to conduct a detailed purity analysis on the produced silicon and to device experimental setup which prevents contamination. Two types of SiO2 contacting electrodes were devised, in which only Si is in contact with SiO2 (Fig. 4-6). By using these electrodes, SiO2 plates and tubes were successfully reduced to silicon in molten CaCl2 at 1123 K. Metal impurities in the produced Si were significantly decreased compared with our previous study owing to the adoption of the new electrodes and a quartz vessel. It was also found that the remaining CaCl2 and some metal impurities in the produced Si can be removed effectively by using NH4OH/H2O2/H2O, HCl/H2O2/H2O and HF/H2O2/H2O as cleaning solutions. Most of the impurity elements were below our target levels which were calculated from the acceptable impurity levels for SOG-Si and the segregation coefficients for the impurity elements. Fig.4-6. 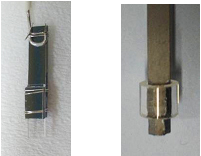 Photographs of new SiO2 contacting electrodes. (a) A SiO2 plate is sandwiched between single crystalline Si plates and wound by Pt wires. (b) A SiO2 tube is fixed to a polycrystalline Si rod. The purpose of this research is to develop a new technology of nanoprocessing with femtosecond (fs) laser pulses, for the purposes of achieving a high efficiency of thin-film solar cells. The study in 2008 was concerned with the following objectives: (1) One was to understand the physical mechanism of periodic nanostrcuture formation on thin film targets that we observed for the first time with fs laser pulses. It has been found in our previous experiment that the nanoscale ablation is initiated with the generation of near field (local field) around small surface roughness. We intended to make clear its subsequent interaction process for periodic nanostructure formation to develop a theoretical model. The experiment was designed to observe the most initial stage of nanostructuring on diamond-like carbon (DLC) film with linearly and circularly polarized femtosecond (fs) laser pulses. Based on the results, we tried to control the nanostructure; (2) The other was to demonstrate the validity of a quantum mechanical theory for high-order harmonic generation from coherently rotating molecules, which we have recently developed. Especially, we have shown that HHG from aligned molecules is able to provide us with a new method for accurate measurement of degree of molecular alignment and rotational temperature. We have successfully made clear the following physical process for nanostructuring of hard thin films, which consists of the bonding structure change and resulting surface swelling, the generation of near field on the swelled surface, the initiation of nano-scale ablation, and the excitation of surface plasmon polaritons (SPPs). This model accounts well for the characteristic properties of observed nanostructure and provides a good agreement between the calculated nanostructure period and the observed. Based on the physical model, we have demonstrated that the nanostructured surface can be controlled so as to have a sawlike shape with obliquely incident p-polarized pulses. In order to apply the present model to semiconductor materials, an experiment of fs-laser ablation has been made for silicon (Si) substrate. The results have demonstrated possible formation of periodic nanostructures on Si surface under some specific experimental conditions for ablation. The nanostructuring process for Si was almost the same as for DLC or dielectric materials, while additional competing processes were inevitably induced to restrict the nanostructuring. On the other hand, high-order harmonic generation from coherently rotating N2 and O2 molecules has been observed for different alignment angles in a pump and probe experiment using fs laser pulses. The results obtained are in excellent agreement with those calculated using a recently developed theory. It is shown that the polarization geometry and the alignment distribution play essential roles in potential applications to probe electronic structure and dynamics of molecular systems. 5)	It has been demonstrated that HHG can be used for sensitive measurements of molecular rotational temperature in a thin supersonic gas beam. The results show the versatile applicability of this new method. Efficiency of solar energy conversion by a solid surface depends on microstructure and chemical component of the surface. Evaluation of the interface in situ in the fabrication process or under actual use is important for monitoring the processes and controlling the process parameters. In the present work we aim at the establishment of micro-LIBS (laser induced breakdown spectroscopy) for in situ elemental mapping of photo-electrodes. In this fiscal year, we tried to clarify the reason of the pulse-to-pulse fluctuation of the spectral intensity, especially focusing on the instability observed in the analysis of an alloy in water. We investigate the timing of the bubble formation by shadowgraph measurement under the irradiation, and the pulse-to-pulse fluctuation of the emission intensity. Also, we measure emission spectra of the species ablated from Cu-Zn alloy under water, and obtain calibration curve for the Cu/Zn ratio. Finally we investigate the error and fluctuation in the resultant composition ratio obtained by using the calibration curve. The cause of the pulse-to-pulse fluctuation of the spectral intensity was clarified by the observation of shadowgraph. The bubble observed in the shadowgraph showed fluctuation in its size and also in its shape after consecutive irradiations. The laser breakdown in the bulk water or the fluctuation of the position where the ablation initiates were observed. On the other hand, Cu-Zn alloy was employed to investigate the pulse-to-pulse fluctuation of the component analysis in water. The model calculation assuming the Boltzmann distribution for the population between the levels involved in the transition improved the pulse-to-pulse fluctuation. This is probably because the fluctuation caused by the temperature instability is compensated. To synthesize new efficient materials for solar cells it is often useful to utilize a mid-infrared laser with short pulse duration for the analysis, since the mid-infrared “photon” energy corresponds to the “phonon” energy of the materials. It is, however, desired that the laser is available at more than a single wavelength: If perfectly synchronized laser pulses are simultaneously available at different wavelengths such as the mid-infrared, near-infrared, and perhaps to the visible region, the usefulness of a polychromatic light source is out of doubt. One way to realize a polychromatic light source is to use frequency-conversion techniques such as second harmonic generation (SHG), third harmonic generation (THG), and fourth harmonic generation (FHG) processes, etc. If we initially have mid-infrared laser pulses at the wavelength of ~12 μm, even the FHG is at 3 μm and still in the infrared region. To produce shorter wavelength pulses, we have to utilize high-order harmonic generation (HHG), which is possible if the initial mid-infrared pulses have sufficient pulse energies. 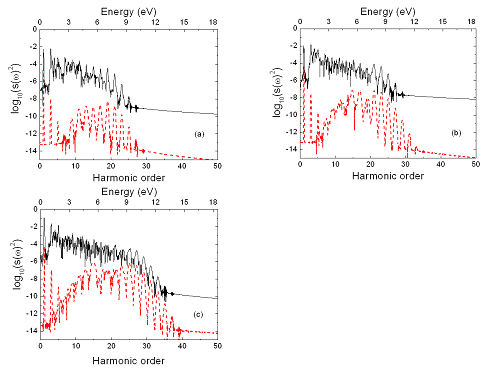 In this work we investigate the interaction of alkali-metal (potassium) atoms with mid-infrared laser pulses, the purpose of which is to clarify at what mid-infrared laser intensity the high-order harmonic photons are produced up to which order with what signal intensity. We employ a single-active-electron approximation and numerically solve the time-dependent Schrödinger equation (TDSE) for the potassium (K) atom. To circumvent the computational difficulty we employ the one-dimensional (1D) model. The HHG spectra can be obtained by taking the Fourier-transform of the time-dependent dipole. Representative results are shown in Figs. 4-7(a)~(c). The laser wavelength and the pulse duration are assumed to be 3.3 μm and 110 fs, respectively, while the laser intensity is varied from 7×1011, 1012, and 1.4×1012 W/cm2. In each panel the solid (dashed) line represents the result obtained with the soft-core (short-range) potential. The purpose of comparing the results with the two different potentials is to see the effect of the excited bound states, since the mathematical expression of the short-range potential has been chosen such that the ionization potential is exactly the same with that for the soft-core potential, while there are no excited bound states. Firstly, the conversion efficiency for the soft-core potential (solid lines in Fig. 4-7) is much larger than that for the short-range potential (dashed lines in Fig. 4-7). We point out that the intensities we have chosen correspond to the transition regime between the multiphoton and tunneling ionization processes, and therefore there occurs a competition between them. For the case of the soft-core potential, the existence of the excited bound states enhances the ionization probability, which in return increases the recombination probability, resulting in higher harmonic intensities. Secondly, the HHG spectra for the short-range potential reveal more distinct peaks than those for the soft-core potential, especially in the lower order harmonics. Namely, the lower order harmonics decay rapidly for the short-range potential, which is consistent with the perturbation theory. In contrast, they are almost constant for the soft-core potential. Of course, this difference can also be attributed to the effect of the excited bound states, since there are no excited bound states for the short-range potential. The last remark concerning Fig. 4-7 is that the difference of the HHG spectra by the two different potentials becomes smaller as the intensity increases from Figs. 4-7 (a) to 1(c). This must be due to the fact that the contribution of the electron rescattering after the tunneling ionization processes directly from the ground state becomes more dominant than that from the excited bound states as the intensity increases. We expect that the HHG spectra by the two potentials become even more similar at higher intensities since the excited states play lesser and lesser roles, although the difference originating from the different ground state wave functions still remains regardless of the intensity. Fig. 4-7. HHG spectra of the potassium atom irradiated by the 3.3 μm and 110 fs laser pulse at three different peak intensities, (a)7×1011, (b)1012, and (c)1.4×1012 W/cm2. In each panel, soft-core (solid) and short-range (dashed) potentials are employed for the calculations. Our research group aims at developing a novel evaluation method for solar cell materials by use of Our research group aims at developing a novel evaluation method for solar cell materials by use of Mid-Infrared Free Electron Lasers (KU-FEL), as well as investigating a new material processing to control the energy bandgap structure of wide-bandgap semiconducting materials for high efficiency solar cell by use of microwave heating. Particularly, we will study the energy states of mid and sub-band, and life time and band-edges through investigating a photoluminescence (PL) by UV-visible laser synchronizing a FEL laser, in order to understand the correlation factors of surface stats and mid/sub-band structures of semiconducting materials for solar cells. For the above purpose, we successfully developed the microwave material processing to control surface states of wide-gap semiconducting materials such as TiO2 and ZnO in cooperation with Research Institute for Sustainable Humanosphere (RISH), and applied a patent in this year. In addition, a mid-infrared free electron laser (MIR-FEL) facility (KU-FEL: Kyoto University Free Electron Laser) has been constructed for energy science in Institute of Advanced Energy (IAE), Kyoto University. Lasing at 12μm was observed for first time at IAE in March 2008. A beam loading compensation method with an RF amplitude control in the thermionic RF gun was used to qualify the electron beam. A developed feedforward RF phase control was applied to stabilize the RF phase shifts. As a result FEL gain saturation at 13.2 µm has been achieved for the first time in May 2008. Now we are developing the FEL beamline for chemical and renewable energy research by using MIR-FEL (5-20 μm). At same time, we installed a photoluminescence (PL) measurement system with He-Cd laser (325nm/ 442nm), and have started to measure a PL spectra for TiO2 and ZnO. In next year, we are going to develop the in-situ PL measurement system during FEL irradiation, and establish novel optical measurement methods of semiconducting materials as well as solar cells to develop a high efficiency solar cell.